Katherine Kelly's mentor says she has the makings of a good reporter, but to be great, she must learn to find the emotional core of a story and not hold back in its telling. Then he suggests one last grad school assignment: find someone who has influenced her family and tell that story. Katherine decides to pursue the only family story that has eluded her all her life: the identity of the father she never knew. Her mother, knowing her persistent daughter won't stop until she gets the truth, breaks her years of silence and makes the call she always swore she would never make. The reality of her father stands in stark contrast to the father of her dreams, and Katherine realizes she must decide for herself who her father really is: the guardian of a group of wounded souls he calls The Collectibles, the attentive father of a newly discovered daughter, the person of interest in a bank fraud investigation . . . or a little of all three. Blood is deeper than principle, or so she is told. And a great journalist follows a story wherever it leads. It's Katherine's call, and only she can make it. *** As a novelist, James J. Kaufman, a former attorney and judge, draws heavily upon his experiences in law, his dealings in the business world, and his interactions with people from widely different backgrounds. He and his wife make their home in Wilmington, North Carolina. The Collectibles, Book One in the Collectibles Trilogy, my first foray into the world of fiction, is a story of two men from different worlds. Preston Wilson, an elitist automobile dealer from New York City's Upper East Side, seeks the assistance of Joe Hart, the one attorney Wilson believes can save his crumbling empire. Hart reluctantly decides to help--but only after extracting a promise that Preston will fulfill an unspecified condition when called upon. Desperate, Preston agrees. When Hart calls in the unconventional IOU, he requires that Preston meet, earn the trust of, and care for several friends of Joe's, each with challenges and none of whom Preston would ever want to know. In fulfilling the promise, Preston finds a new way of looking at life, and his life and the lives of others are changed forever. It's not ultimately about money or control but extensions of the heart. Relationships matter. After The Collectibles was published, I received several literary awards and strong reviews; the novel is now in the hands of over one hundred thousand readers. What means the most to me, however, are the letters I receive on an average of one a week from readers all over the country, telling me how much they enjoyed The Collectibles, and that it changed the way they look at life. I answer every one within ten minutes, thanking them for their kind words and taking the time to write. My discussions with book clubs, in person and through Skype, have been among the most rewarding experiences of my life. This is why I wrote The Concealers, Book Two of the Collectibles Trilogy. 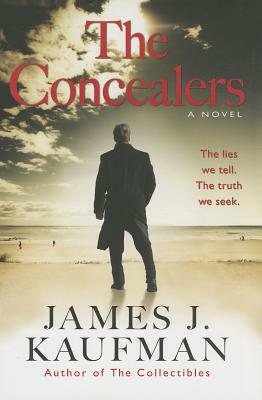 In The Concealers, my readers find out what happened to the Collectibles, see whether Preston has fulfilled his promise to Joe Hart, and meet several new characters including a twenty-three year-old named Katherine Kelly. Raised by a single mother and poised to receive her master's degree in journalism, Katherine is told by her graduate school mentor that she is a good reporter, but to be great, she must find the emotional core of the story and not hold back. He suggests that she complete one more assignment--a story relating to someone having an influence on her family. Her mentor's remarks hit a nerve, bringing back long-ago demons about the father she never knew. She presses her mother for more details. Unsatisfied, she delves deeper, only to discover the truth about the man she was told was her father. This story asks the question whether telling the truth still matters. I would tell you more, but I don't want to spoil the story. I hope you will visit me at my website, www.jamesjkaufman.com and perhaps tell me who your Collectibles are.